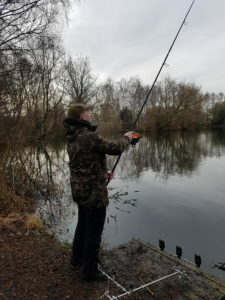 Scott came along last week for a Carp tutorial. We began with how I go about swim choice and how important locating the fish is to this choice. After an hour of watching the water in front of me like a hawk I saw 2 Carp roll in front of one swim. So swim choice was easy. Scott set up in the swim where the Carp had shown themselves and I set up in the swim next door. We then went over how and why I set my swim up in a particular way. We then discussed bait choice, application and how to improve the attractiveness of your bait. After a cup of coffee we then moved onto the subjects that Scott had told me he wanted to improve on. These were feature finding, feeling the lead down, wrapping and clipping up along with how to “creep” towards a far margin spot. By the end of the day all 3 rods were on spots that Scott had found himself and he was “feeling the donk” on every cast. All too soon our time together was coming to an end and it was looking like a blank when suddenly Scott’s left hand rod let out a serious of bleeps and the bobbin had pulled tight but unfortunately Scott lifted into nothing. To be fair I think the Carp have not woken up yet and with no Carp out since November the odds were stacked against us. I have to admit though that it would have been a nice way to end the tutorial. Scott has booked a 48 hour carp tuition with me in May when fingers crossed the Carp will play ball and I have to say I am really looking forward to it. This entry was posted in carp, tuition, tutorial and tagged carp, carp tuition, carp tutorial, feature finding, feeling the donk.